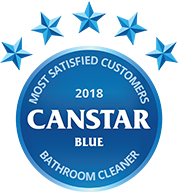 Compare bathroom cleaners from Orange Power, Ajax, ALDI, Dettol, Domestos, Earth Choice, Jif, Pine O Cleen, Shower Power, White King, Coles, Easy Off Bam, Exit Mould, Harpic, Mr Muscle, Woolworths and Windex with Canstar Blue’s customer review & ratings. It’s the most competitive home cleaning category out there and it’s been topped by Aussie brand Orange Power. Consumers have rated 18 different bathroom cleaners but Orange Power was the only one to achieve five stars for effectiveness and overall satisfaction in 2018. If you’re a bit of a clean freak, then the bathroom is probably the centre of your universe. With so many surfaces to wipe down and sinks, showers, taps and tubs to scrub, it’s easily one of the toughest cleaning jobs in the home. But for many of us, a clean bathroom is the pride of our home, so you’ll want to be as meticulous as possible. That means you’ll need the help of a reliable bathroom cleaner that can defeat those stubborn stains and mould with relative ease. Which brands are up to the challenge? Once again we’ve surveyed more than 2,000 Australian adults to find out. This is one of our most competitive ratings categories, with no fewer than 18 different brands featuring in the results this year, including supermarket private labels, Aussie-owned companies and global brands that typically take up the majority of shelf space in your favourite supermarket cleaning aisle. This year, it’s a case of the local brand ‘done good’ with Orange Power cleaning up in the bathroom stakes. Owned by Melbourne-based Aware Environmental, the eco-conscious brand has been a strong-performer in our annual cleaning reviews over the years, especially when it comes to carpet cleaner. Now Orange Power has taken out the big one! In addition to overall customer satisfaction, Orange Power was the only one of the 18 brands to score top marks for effectiveness, product design and smell. It earned four stars across all other research areas. It was four stars overall for Ajax, ALDI Powerforce, Dettol, Domestos, Earth Choice, White King, Jif, Shower Power and Pine O Cleen. 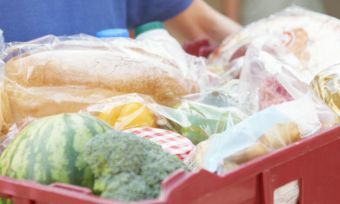 Top marks were in fairly short supply, with ALDI earning five stars on value, Dettol praised for its ease of use, and Earth Choice awarded five stars in terms of environmental friendliness. Coles, Coles Ultra, Easy Off Bam, Exit Mould, Harpic, Woolworths Homebrand, Windex and Mr Muscle all rated three stars for overall customer satisfaction. The result is an awesome achievement for Aware Environmental, with its Orange Power ‘Shower, Bath & Tile Cleaner’ relying on the natural cleaning power of orange oil and fruit acids, rather than the solvents and bleaches that are found in many products. Orange Power replaces Jif at the top of the standings and builds on its result of four stars overall in 2017. It’s interesting to note, however, that Orange Power also achieved five stars for its smell last year. If it’s a pleasant scent you want from your bathroom cleaner, in addition to effectiveness of course, there seems to be an obvious choice. Here is an overview of the 18 brands in this year’s bathroom cleaner review, in order of their ranking. Aussie-owned Orange Power relies on all-natural ingredients in its home cleaning products. It was born out of the realisation that orange peel has effective cleaning properties. The Shower, Bath & Tile Cleaner claims a powerful, fast-acting formula that can dissolve soap scum, water and rust stains in just minutes, without harsh fumes. It comes in a 750mL recyclable bottle with trigger action and is said to be suitable for shower screens and bases, baths, spas, basins, tiles, toilets bowls, taps and chrome faucets. 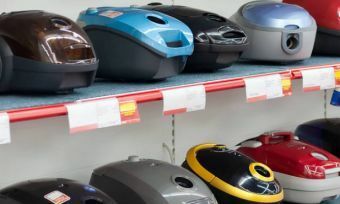 It seems a popular choice with Aussie consumers, who have rated it five stars for overall customer satisfaction, as well as effectiveness, design and smell. 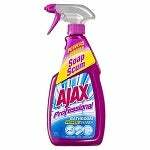 From the Colgate-Palmolive group, Ajax’s ‘Professional Bathroom Cleaner’ comes in a seemingly easy to use trigger bottle and is said to be useful for grime, soap scum and rust stains. This makes it perfect for easy, general bathroom cleaning and for older sinks and taps that perhaps suffer from rust. The brand’s cleaning range also includes a bathroom cleaner specifically for mould. Ajax proved a solid performer in our latest review, scoring four stars across most research categories, including overall satisfaction. 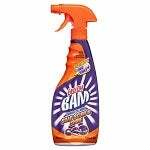 Discount supermarket chain ALDI offers a range of cleaning products, with a fairly strong presence in the bathroom cleaner segment. 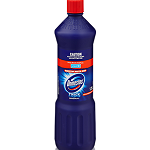 Its ‘Bath & Shower Cleaner’ is claimed to cut through grease and grime and kill 99.9% of germs. ALDI says it has been independently tested and shown to outperform leading brands at less than half the price. Aussie consumers are generally big fans of ALDI and seem impressed with its bathroom cleaner, rating it four stars overall and the same result across most other research categories. It was also, notably, the only brand to earn top marks on value for money. Dettol was also a fairly solid performer this year, earning four stars for overall customer satisfaction and likewise in most categories. However, it notably scored five stars when it comes to ease of use – the only brand to do so. It has a range of products for all surfaces in the bathroom, and not only gets rid of grime, but also disinfects. 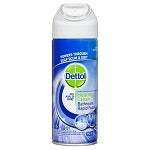 Dettol’s ‘Rapid Foam’ bathroom cleaner seems to be its main product for bathrooms and Aussie consumers seem reasonably impressed. Domestos seems to be a cleaning brand with a conscience as it has partnerships with Unicef and other organisations to promote sanitation and hygiene in developing countries around the globe. Its bathroom cleaning products performed solidly in our latest review, with four stars for overall satisfaction and four stars for effectiveness. If you’re concerned about sanitation and hygiene issues abroad, Domestos might be the brand for you. However, it was let down with only three stars in other areas, including smell and value for money. 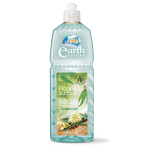 Eco-conscious Earth Choice was perhaps unsurprisingly the only brand to get five stars on environmental friendliness this year. Earth Choice is free from harsh chemicals like ammonia, and is also septic and grey water safe. That doesn’t mean it’s a slouch in the cleaning department though, scoring four stars across most research categories. 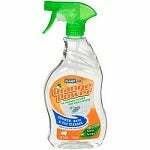 It has two products that can be used for bathroom cleaning – a spray for glass surfaces and windows, as well as a standard bathroom and shower cleaner that is claimed to be specially formulated to remove soap scum and build up. 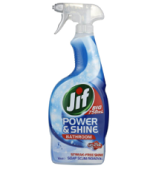 The Jif brand includes a range of trigger spray cleaning products, including its ‘Power & Shine’ bathroom cleaner that is claimed to deliver a deep clean and streak-free shine every time. And who could forget Jif Cream Cleaners with their original or lemon scents, which can also be used for bathroom cleaner. Jif was the winner of our bathroom cleaner ratings in 2017, but this year has to settle for four stars overall, plus four stars in most other categories. 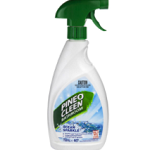 Pine O Cleen has a large range of household cleaning products for the toilet, floors, shower and all kinds of surfaces. Its products are available in a variety of scents, and most come in easy-to-use spray bottles, including the modestly named ‘Ocean Sparkle’ disinfectant trigger spray. But despite topping our latest review of floor cleaners, Pine O Cleen has fallen short in the bathroom, rated four stars overall and four stars in most other categories. Shower Power from OzKleen is claimed by the Gold Coast-based company to “actually work”. 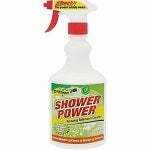 It may not have achieved top marks for effective bathroom cleaning, but Shower Power was a solid performer and earned four stars across most research categories. 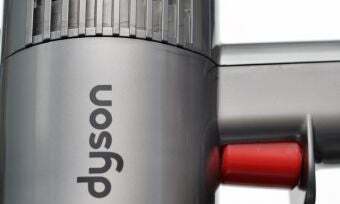 Its spray bottle is available with a range of fragrances, and is apparently best designed for removing soap scum and grime around taps and sinks. The company had better luck with our latest review of oven cleaners, scrubbing up best in that category. 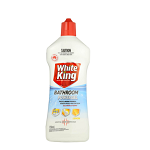 White King is a household name for cleaning bathrooms. It has a large range of cleaners for the shower and toilet, as well as numerous ‘do-anything’ bleach products for all white porcelain. The range includes the hospital-grade disinfectant ‘Bathroom Power Gel Lemon’ that claims a thick cleaning formula to get rid of mould and soap scum. White King had a decent bag of results this year, achieving four stars overall and the same outcome in most categories. 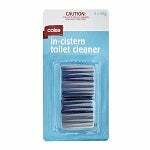 Supermarket giant Coles provides a fairly basic range of bathroom-cleaning products, as well as cistern cleaners. Its prices are typically dirt-cheap, but evidently that wasn’t quite enough for Aussie consumers who rated the cheapest of Coles’ private label brands at just three stars for overall customer satisfaction and three stars in all other research areas. This was a consistent outcome for Coles across most cleaning research categories this year. 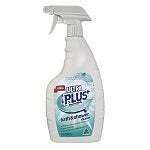 A step up in price and presumably in quality compared to the cheaper Coles home brand, Coles Ultra has plenty to offer bathroom-cleaning enthusiasts, including a ‘Bathroom Foam Cleaner’ and ‘Bath & Shower Cleaner’ in a modest 100mL trigger spray. However, Coles Ultra ratings reflect those for Coles, with just three stars for overall customer satisfaction and most other research areas. The one exception was four stars on value for money, which suggests that Coles customers who splash out a little extra on cleaning products are generally pleased they did. Easy Off Bam was another brand to achieve a mixed bag of results, earning only three stars for overall satisfaction. 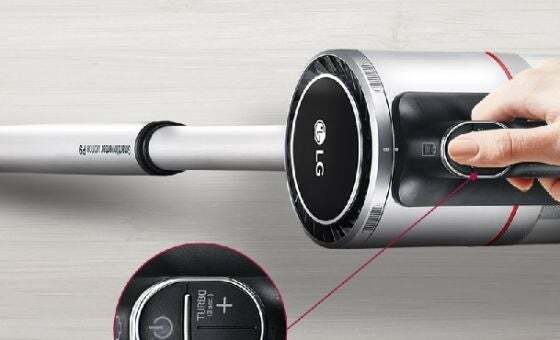 However, it did achieve four stars when it comes to the related categories of product design and ease of use. This is likely due to its easy-use ‘Power Grime and Soap Scum’ spray bottle cleaner. The brand also boasts its ‘Power with Bleach’ cleaner for bath tubs and sinks that claims “unbeatable power that works in seconds” and its ‘Foam Soap Scum & Shower’ cleaner. Aussie consumers are not convinced though, with a disappointing set of results for such a recognisable brand. 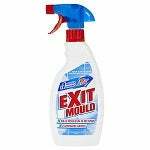 If you want bathroom mould to exit your life, then ‘Exit Mould’ may be the cleaner for you. 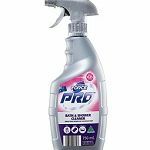 It specialises in anti-mould products, including an easy-use spray trigger bottle designed to reach nooks and crannies. It’s claimed to “attack mould at the source”, however, this specialisation was not enough for shoppers in our latest review, as they rated the brand a disappointing three stars for overall satisfaction this year. It was then a mix of three and even two stars in other research categories. Harpic has a large range of products for every bathroom application imaginable. 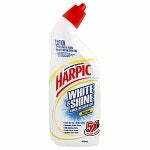 From easy-clean toilet wipes to powerful disinfectants and cistern and pipe cleaners, Harpic has you well covered. It specialises in bleach gels, but Aussie consumers are not currently convinced of its overall bathroom-cleaning ability, rating Harpic just three stars for overall customer satisfaction this year. Its only four-star review came in regards to smell – not to be sniffed at! Mr Muscle was evidently having an off-day at the gym, as it achieved a disappointing three stars overall and indeed for every other research category in our latest review. The brand may be best-known for its oven cleaner, but it still claims to pack a punch in the bathroom, with its ‘Advanced Bathroom and Toilet Cleaner’ and several other bathroom-specific products, including the ‘Advanced Power Shower Shine’. 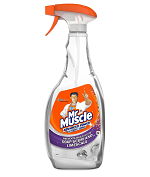 It may take up lots of space on supermarket shelves, but Aussie consumers who use Mr Muscle bathroom cleaners are not blown away right now. 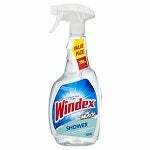 Most famous for being a go-to for window cleaning, Windex also offers a range of bathroom cleaners. Its range includes disinfectant sprays, perfect for getting rid of nasty bacteria, including its ‘Shower Cleaner Trigger Pack’ that is claimed to prevent soap scum and doesn’t even require any scrubbing. In our latest bathroom cleaner ratings, Windex scored just three stars for overall customer satisfaction and all other research categories, with the exception of product design, where it earned four stars. Woolworths has a variety of cleaners suited for the bath, shower and toilet. The fresh food people have performed well with regards to value for money this year – securing four stars – but will be disappointed with three stars for overall customer satisfaction and the same score in every other research category in 2018. Just like with Coles’ cheapest product line, this performance has been mirrored across most other cleaning awards this year. Canstar Blue commissioned Colmar Brunton to survey 3,000 Australian adults across a range of categories to measure and track customer satisfaction. The outcomes reported are the results from customers within the survey group who have purchased and used bathroom cleaner in the last 6 months – in this case, 2,133 people.